I’ve attached a JPG scan of one page from the action report for Task force 128. This was the TF that towed the Mulberry and Whale unite to create an artificial harbor to feed the invasion of Normandy. Whale tow No. 528, consisting of units 528, G-2 and 530, H-2 arrived towed by the tug “superman”. This tug reported that the tow had been found about 1 mile, 058 T. from buoy 58E at 1315, 11 June 1944. The tow was anchored b its towing bridle and had no personnel aboard. There was an oil slick on the water nearby and blood in the tent on the bridge train. Personnel affects were aboard the tow. Later in the day, a despatch was received from NOIC Mulberry “B” reporting that tugs “partridge” and “Sesame” had apparently been sunnk. The Whle units brought in by tug “superman” were those in tow by the “Partridge” when sunk. 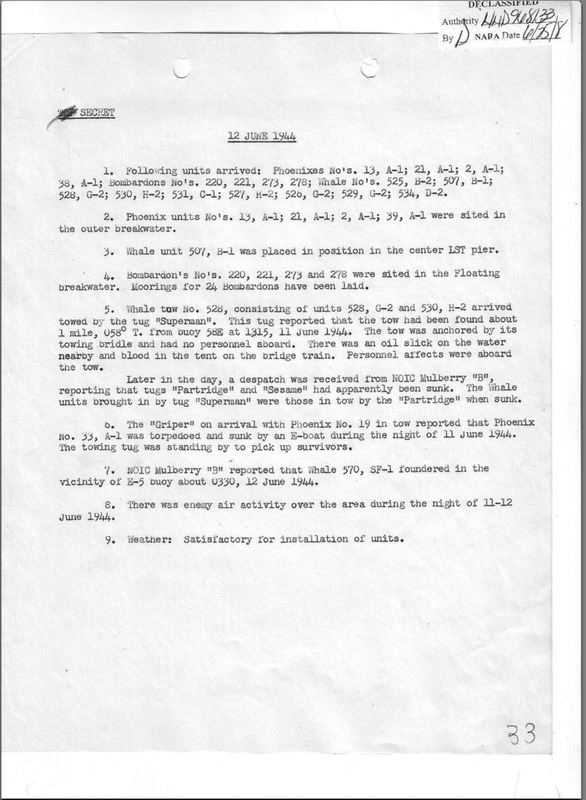 The whale units were vital to the success of this operation and to the D-Day invasion overall. I had never given much thought to whether or not the tow had been picked up but it apparently was used in the acutally invasion. If anyone has any information on the tug “Superman” let me know. It may have been a British tug used in the operation. I’ve attached a photo of the page above. Click on the image for a full size you should be able to read the entry.